As much as I love Autumn, we all know that with it comes colder weather (boo), big jumpers (yay) and the re-acquaintance with our long lost friend – central heating (eek!). Consequently, all these changes to the weather means our skin starts to suffer and most of us start our frustrating search for the product that will help moisturise and rehydrate our skin. I have sensitive combination skin so I prefer to use all natural products where possible. I love home made remedies and try to stay away from products full of sulpathes and parabens. This is one of the biggest reasons that I was initially drawn to Aesop. 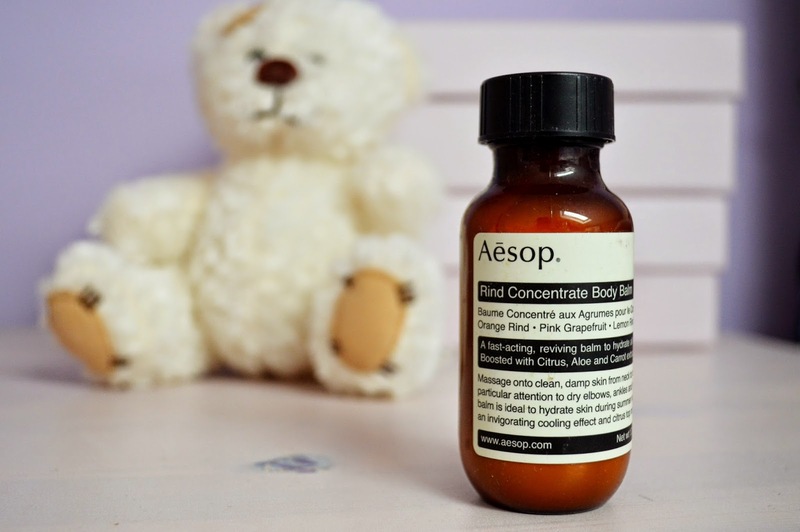 Aesop is an Australian company founded in Melbourne in 1987. They focus on high quality ingredients with an extra focus on anti-oxidants. For the unfortunate bunch of us that are acne prone, this means that by using their natural products you should have a much fewer chance of breakouts! Well, one can only hope! What’s even better is that they have a no animal testing policy. The rind body balm is a fruity blend of tangy pink grapefruit cut with the sharp scent of orange peel and lemon rind. It smells like fresh oranges, but not in the overpowering way some citrus based products can smell of. Besides, for someone who hates the smell of oranges, if I’m pretty happy smothering this all over me, it’s got to smell great! The balm has a great consistency which allows you to feel moisturised without feeling smothered and greasy. It’s thick enough for you to rub it into your skin well without it becoming a task and a half too. I also love that it doesn’t leave a shine, nor does it feel sticky after use. So if this product is so wonderful, how come you’ve never seen it advertised anywhere right? Well, you might be right in noticing their lack of advertising campaigns, as Aesop relies solely on word of mouth. They’ve built up a solid reputation purely on how well their products work and they are now available in London’s biggest department stores both Harrods and Liberty. I love their violet jar style packaging. It’s chic and understated, just like the brand. The packaging often features quotes from the director, Dennis Papithis’, favourite philosophers and authors, giving it a certain quirkiness to it. Despite the slightly higher price tag that comes with it compared to your usual drug store moisturisers and body balms, the product still gets a big fat thumbs up from me. It does exactly what it says on the tin and gives me peace of mind knowing that what I’m using on my skin is full of natural goodness! Have you tried any Aesop products? What did you think?